Identification: Large. 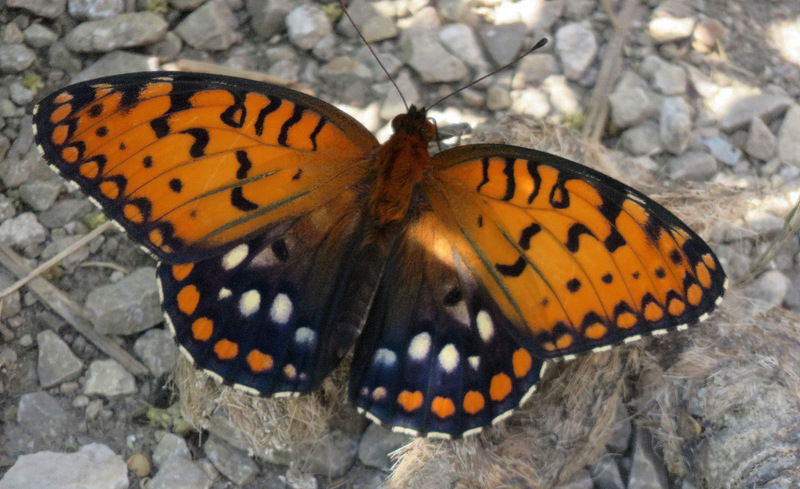 Upperside of forewing bright red-orange with black markings. 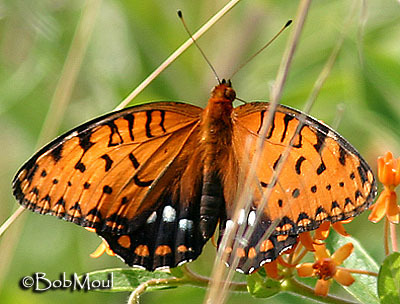 Upperside of hindwing black with postmedian row of white spots; submarginal row of spots is orange in male and white in female. Wing Span: 2 5/8 - 4 1/8 inches (6.7 - 10.5 cm). Life History: Males patrol for females with a low, steady flight. Females walk through vegetation to lay single eggs on various plants, even if the host violets are not present. Most eggs are laid in August. The caterpillars hatch and overwinter unfed; in spring they eat leaves of host plants. Flight: One brood from mid-June to mid-August. Caterpillar Hosts: Violets including bird\'s foot violet (Viola pedata). 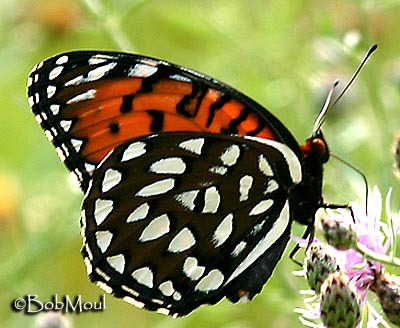 Adult Food: Nectar from flowers of milkweeds, thistles, red clover, and mountain mint. 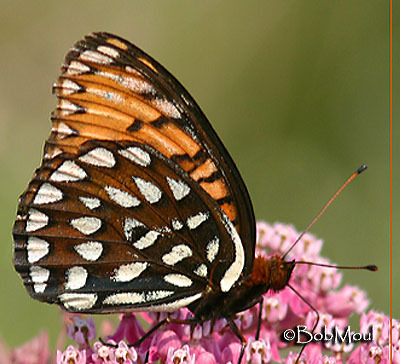 Habitat: Tall-grass prairie and other open sites including damp meadows, marshes, wet fields, and mountain pastures. Range: Tall-grass prairie remnants in Montana and North Dakota south to Colorado, Nebraska, and Oklahoma; rare or absent from former range east of the Appalachians. Conservation: Rapidly vanishing or declining in much of its range. A species of concern for the United States Fish and Wildlife Service. All populations should be conserved. NCGR: G3 - Very rare or local throughout its range or found locally in a restricted range (21 to 100 occurrences). (Threatened throughout its range). Management Needs: Monitor populations and manage populations on public lands and preserves.